Bali National Golf Club is located in THE MAJ NUSA DUA, The Nusa Dua tourism complex who offers a number of star rated hotels, two Convention Centers, a Shopping Center, Restaurants and a Museum, sitting alongside over three miles of white sand beaches. Whether you are a beginner, a pro or just a casual weekend golfer looking for a relaxing Bali golf holiday, Bali National Golf Club is an experience not to be missed. With only a 20-minute drive through Bali Mandara toll road from Ngurah Rai Bali International Airport, Bali National Golf Club offers visitors to Bali a truly luxurious golfing experience with the redesigned Bali National Golf Club which has three distinct playing environments throughout the 18-hole course. Holes 1 through 9 feature creeks, canyons and native vegetation filled with tropical birds, whilst holes 10 through 16 offer the golfer lush gently sculptured fairways through a mature grove. Finally the island green hole 17 and lakeside hole 18 are the challenging finishing holes to test every golfer. The course was awarded by Asian Golf Awards as Best Renovated Golf Course in Asia 2014 and 5th Best Golf Resort in Asia Pacific 2016, Best Golf Resort in Indonesia 2017 by Golf Digest USA, Best Golf Courses in 260 Countries in 2018 by Golf Digest USA, Best Golf Course in indonesia 2018 by Asian Golf Awards and 2nd Best Golf Resort in 2018 by Asian Golf Awards. Bali National Golf Club is also the home of the famous Leadbetter Golf Academy (LGA Bali) as one of the facilities. In addition to LGA Bali, well-appointed Locker Rooms, a well-stocked Pro Shop, The Golfer’s Lounge & Terrace serving exquisite cuisines, VIP Meeting Room and The VIP Lounge facilities, are all available at Bali National Golf Club. It is definitely an experience to stay where you play. The Bali National Golf Villas are located within the resort and boasts 7 luxurious villas overlooking the challenging and stunning 17th and 18th holes. 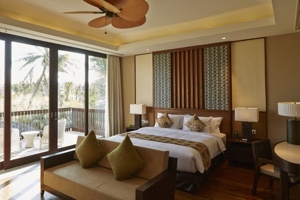 Each villa can accommodate up to 6 guests. 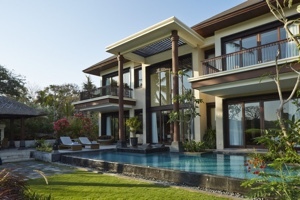 Bali National Golf Villas are proud to offer its guests a unique and incomparable style of service. During the stay, all of our guest’s requests and enquiries are taken care of by the Personal Butler who is exclusively appointed to meet all of our guest’s wishes. Bali National Golf Villas is your place to enjoy the good life in absolute comfort, away from the demands of life back home. It is very private, very personal and we are proud to say, a very different experience from the rest. Bali National is a must visit place for your unforgettable luxurious golfing experience in Bali. "Where Every Day is a Great Golf Day"